These double-pole, double-throw relays can be used for up to 30 amps at 12 or 24 volts DC or 250 volts AC. All contact surfaces are silver alloy with gold flashing. Contact terminals are #8-32 screws and coil terminals are #6-32 screws. 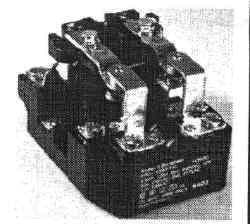 Relays with 120 VAC or 240 VAC coils can be used to build simple transfer switches. Relays with DC coils can be used for remote operation of pumps and fans. By connecting a relay with a DC coil to a voltage controlled switch AC or DC loads may be turned on or off based on battery voltage levels.